I have been trying and trying to find an eco-friendly wedding dress for my September wedding, and it was much much harder than I anticipated. There are a variety of organic companies that sell dresses, and a few designers have environmentally conscious choices, but let me tell you, the options are slim. Heaven forbid you want something that fits your body style, or that you’ll actually look good in! I finally found a few choices I was comfortable with on Etsy. 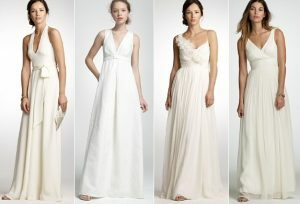 I typed in “organic white dress” and found a myriad of pretty little options. Still not much compared to a bridal store, but it was something. It at least got me to the point where I realized I could get it custom made. Since I have such specific requirements I had to get it custom made. I chose a design I liked from the J. Crew Wedding catalog then set out to find an eco-friendly silk to have the dress made from. Little did I know how hard it would be to find an honest vendor that really knew what their stuff (and wasn’t trying to rip me off). I found the easiest choice was to find a vendor, and let them give me a price and to provide them with fabric I’d researched. I originally asked for organic silk, and was startled to see the price and people throwing the word “peace silk” around left and right. I knew it was time for me to ‘get educated’ about the fabric I wanted for my dress. Peace Silk is a type of unbleached, natural silk, where the silkworms are allowed to live out the entirety of their lives. Ordinarily with silk, only a few of the worms are allowed to fulfill their natural lives and emerge from their cocoon. With Peace Silk, all of the worms are allowed to fulfill their natural lives, and the silk from the cocoons is harvested. It is also referred to as vegetarian silk or Ahimsa (non-violence) silk. Tussah silk is also very similar to peace silk, in that the moths live out their natural life and their cocoons are harvested after they’ve been vacated, however Tussah silk refers only to wild silk worms. The color of Tussah also tends to be a bit darker due to a different diet than cultivated silk worms. Since I am not a vegetarian, peace silk appealed to me because of it’s organic nature. However, I didn’t want to just go with peace silk without doing my homework. I found that there are a variety of eco-silks that use low-impact dyes, or remain un-dyed altogether. I found a fair amount of un-bleached silks that were finished (also known as being ‘sized’) with something other than the usual formaldehyde which is a known carcinogen. This appealed to me since I would still be ale to get a fairly crisp white, instead of the completely natural peace silk which comes in a natural white. When it came down to deciding between peace silk, and simply an environmentally friendly silk, I decided to go with the eco-silk. My rationale was the more I thought about the peace silk, I realized that by allowing all those silk worms to live out their lives you are simply killing them after they emerge. Hear me out. If you look at the math, you’re just allowing the silk worms to starve once the emerge, since we cultivate silk worms in amounts that are way beyond natural. Unless the whole world is covered in the billions of moths that emerge, then you can see that we’re just killing them off after they emerge. Also, I was able to read plenty of articles about so-called peace silk, that wasn’t actually that peaceful when you got right down to it. Since there was so much mystery and uncertainty, I decided that eco-silk was the way to go. Also, I am not a vegetarian so it was okay with me to support the traditional harvesting method. In the end I have a beautiful dress, and I feel that I did enough homework to justify my purchase. Perhaps you disagree, but to each their own. Great! Great! Great! Have never heard about it before. Thanks for educating me! Thanks for enlightening me! I am just getting into eco-fashion, and I didn’t realize there was such a difference between organic silk and environmentally friendly silk. Although Peace-silk is organic, It’s good that you did your research because it sounds like it isn’t all that peaceful to starve the silk worms once they emerge. I think it’s great that you are wearing an environmentally friendly dress on your wedding day. It is such a special day, and what better way to spread your thoughts about the environment then with the prettiest dress in the room! Fashion can be used as a tool to inform others. Wearing eco-silk on your wedding is a great way spread the green message! Great article! Can you supply the link where you found the eco-silk you like? thank you! Sorry this is a bit late, but the eco-silk I chose was from Aurora Silk. I loved the feel, and when I had it cleaned at a green cleaner it came back perfect! Oy. I came here reading about peace silk but reading this has put me firmly in the non-silk or anything resembling it camp. It’s a dirty industry as a whole and I think I’d rather encourage a different bridal look. Who wants to wear dead bug shells anyway? Moths that emerge from “Bombyx Mori” peace silk cocoons are not starved. They are not able to eat. They live for 7-10 days after emerging from the cocoon. They mate and die. The “peace” means that the moth was allowed to live it’s live cycle. Knowledge is the key to all decisions we make in life. Study and learn.